With gilt. 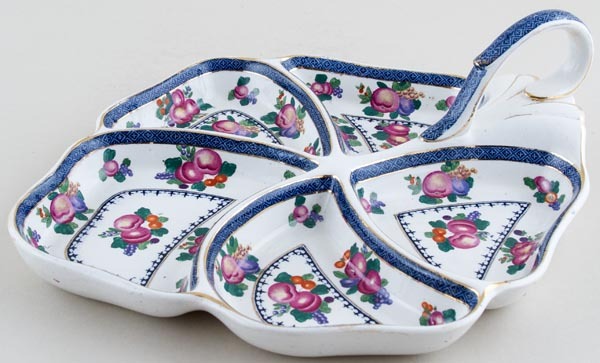 An unusual shape dish, larger than the standard hors d'ouevres dishes with very attractive shaped compartments. Backstamp: Booths Silicon China Made in England plus blue printed retailers mark T Goode & Co Ltd London. Some signs of wear especially to the gilt and to part of the rim a little discolouration. OVERSEAS SHIPPING OUTSIDE EUROPE Owing to the size of this item a supplement of � about US$52 will be added to the standard overseas shipping charge.